After a VERY busy week I am happy to say my Christmas decorations are finally neatly packed in their boxes and are in their home in the garage. Whew! What an undertaking! For the past week my house looked like a tornado ripped through my entire first floor with boxes and things lying all over the place! As much as I love the Holidays I am happy to have a sense of normalcy and a regular routine back in my life. I am a creature of habit and when my daily routine gets awry I feel like a fish out of water! This past week I finally got the chance to dive into my bucket list of projects for 2012. I was able to find some time to straighten up my garage abit which allowed me to work on a “Pantry” for the kitchen. I started it months ago but it has been sitting on the back burner since October. It felt SO GOOD to turn on the music and pick up a paintbrush. More on my “Upcycled Pantry” in a near future post. 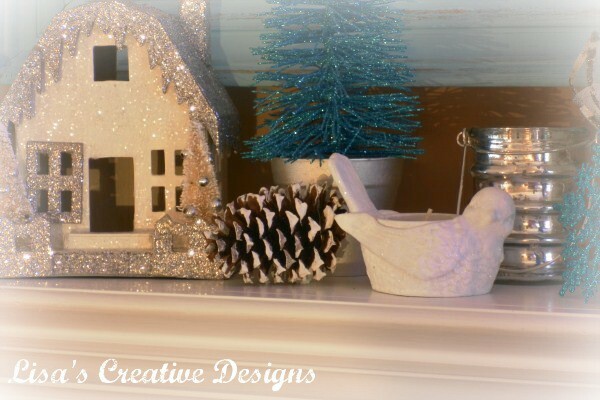 Today I want to share with you my Winter Inspired Mantel. You may remember my adorable Bethany Lowe Snowmen I purchased from Marshall’s? Well I was really reluctant to pack these cuties up yet. 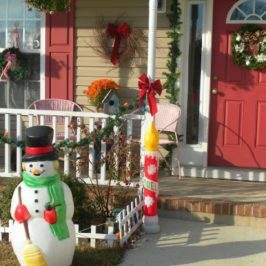 I began thinking….”Who says Snowmen only have to be displayed at Christmas??? ?” I mean, Snowmen are made all winter long aren’t they? Well, as long as there is SNOW on the ground they are! Even though we have not seen one snowflake this year yet in Eastern NC, that’s beside the point. 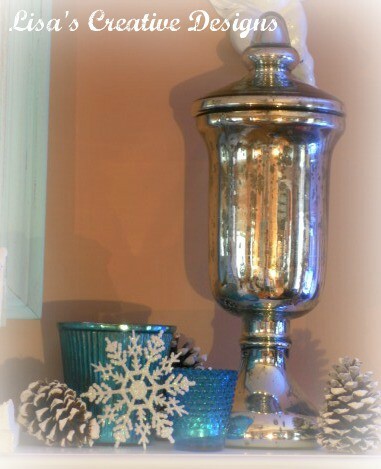 I decided to keep my snowmen and my winter cottages out for just a wee bit longer…..
A few new mercury glass purchases were added. I found this gorgeous aqua blue piece at Home Goods. (Gosh I love that store!!!) The small embelished candle holder was another Marshall’s find….. Along with this silver beauty! I’ve noticed mercury glass popping up all over the place and I’m lovin’ it. A few white snowflakes and snow covered pine cones complete the look. Here’s a crafter’s tip for you. To create “Snow” covered pinecones, just dip a found pinecone in some spackle and let dry. It’s so easy! 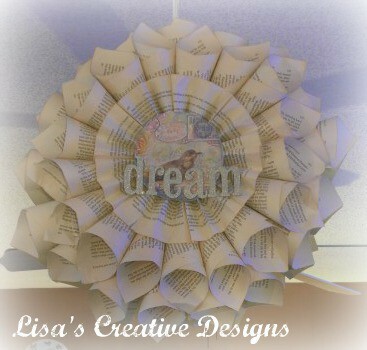 On the mirror I hung one of my newest book page wreath creations. 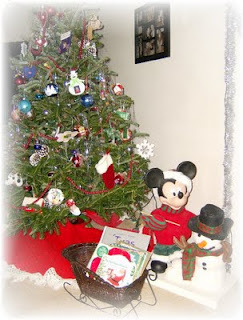 I love my Christmas ones so much I wanted to create one that could stay out all year ’round. 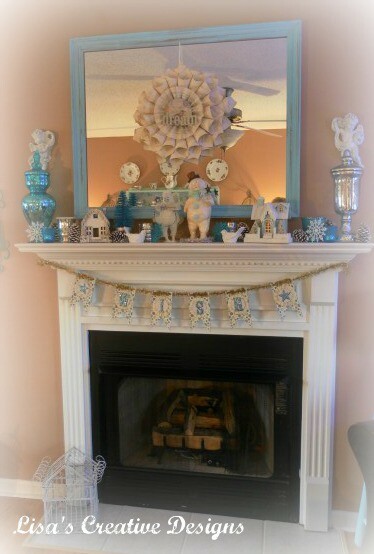 And this is my Winter Inspired Mantel for 2012. What do you think??????? 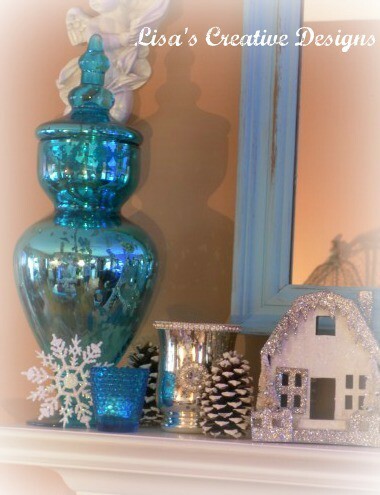 Your mantel reminds me of my winter 2012 mantel. You should check it out. 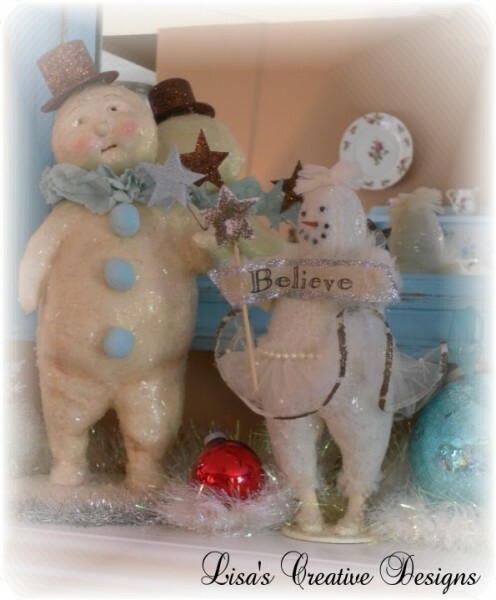 And I love Bethany Lowe snowman and just purchased my first. I think snowmen can stay out till spring or when you get tired of them. I love your mantel. And my daughter’s name is Lisa by the way. I love that name and named her that because every Lisa I ever knew was a very strong woman. 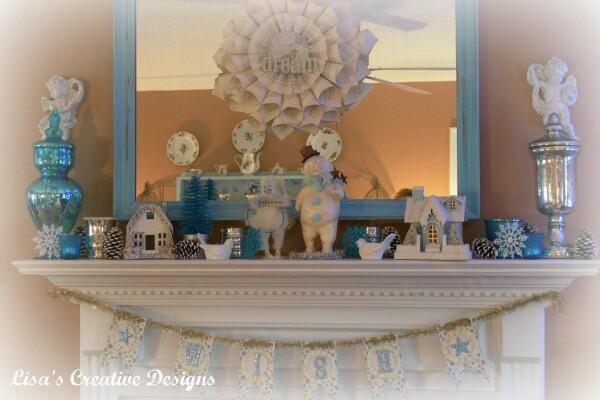 Love your winter mantel. 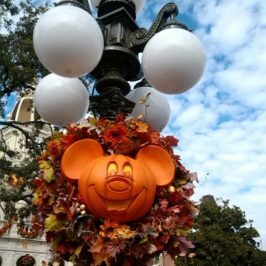 Yes, keep the decorations up for winter! I have your snowlady, too, and think she is so cute. Mine is still on my mantel. 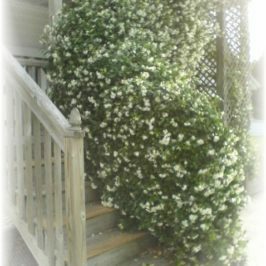 I’m your newest follower, and hope you will stop by and view my posts. The Mantel you used reminds me of my family house.